Retirement Education Services hosts regular one and two day retirement planning open courses at different venues around the country, open to all individuals and couples approaching retirement. Expert speakers are provided to help you plan for all the important retirement subjects to do with money, pensions and lifestyle issues. We recommend that employees attend a pre-retirement training programme at least three years prior to retirement. By doing so, those attending have time to prepare rather than do everything at the last minute. It’s essential that female employees or the partners of male employees attend before their state pension age even if they intend to work past this age. If they don’t, they risk losing thousands of pounds of state pension by failing to have paid sufficient national insurance contributions. We do urge employers to allow partners, other family members or a friend to accompany the retiree. This is because retirement will affect all those that they interact with. Whether family or friends, our pre-retirement training course has various topics that will interest everyone. Because most people worry if they’ll have sufficient money in retirement, ensuring finances are planned thoroughly is dealt with comprehensively. There is, however, a lot more to consider than where to save or invest with little or no risk. We look at tax allowances and how to protect savings against the effects of inflation. The benefits available from the state are outlined, as are the qualifications for the state pension. Top-ups available for those on low incomes or for those caring for sick and elderly relations are discussed too. There are usually sessions on health issues such as the benefits of exercising, health check-ups and enjoying food and drink. You can learn the pros and cons of making wills, and the risks you subject loved ones to if you don’t. The importance of Powers of Attorney for single people or concerning elderly relatives and guardianship of grandchildren are also discussed. Suggestions concerning the use of the additional leisure time are covered. Whether it is for further paid or voluntary work, holidays or activities that continue to stretch and motivate you. The importance of setting new goals and challenges is considered along with new importance of establishing a new identity or status. Many people consider moving property at retirement. This is discussed as are safety, security, mortgage and insurance aspects. We also look at care in the community and safeguarding your property if residential care becomes necessary. 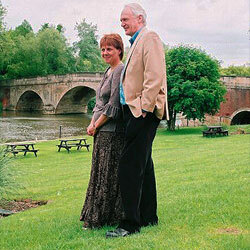 With our retirement courses we are very careful not to embarrass people regarding their private affairs. No-one has to make speeches, complete tests or even make notes. The style is informal and conversational. We use a lot of humour and even award a prize. There is usually an opportunity to discuss private matters with certain speakers outside of the group sessions if you wish to. At the end of the course we issue to each delegate (or couple) a course pack in an attractive wallet. 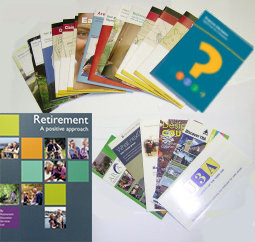 It contains a copy of our book ‘Retirement – A Positive Approach’ as well as a very comprehensive collection of booklets and leaflets relevant to all aspects of retirement. Participants may also contact us for free of charge advice at any time following a course. This can be for additional help on state benefits, health issues, wills or anything else covered on the course. If you are interested in attending an open course yourself or in booking an employee onto one, please contact us. This is because further dates and venues to the ones shown above are always being considered as a result of enquiries received.